Are you looking for natural calcium supplements and having a hard time figuring out which products are good? The best calcium supplements are readily absorbed by the body and contain other ingredients that enhance this process. I can hardly believe it when some of my clients tell me that their calcium supplements make them feel sick. What are you taking? Does everyone need a calcium supplement? Some people have plenty of calcium, they simply need to work on ensuring the calcium is being transported to the bones. Magnesium is important for this. Others may need more protein, or they may need to improve protein metabolism. Most calcium supplements on the market are in the form of calcium carbonate. This is a form of inorganic calcium, from dolomite, bone meal or oyster shell, which may contain heavy metal or lead. It is a chalk-like substance that the body has difficulty absorbing. too much calcium and it ends up as excess calcium in our body? The best natural calcium supplements are either herbal, calcium phosphate, dicalcium or tri calcium phosphate, calcium citrate, or gluconate. Chelated calcium simply means that the calcium is bonded to an organic acid or an amino acid. This way the body more easily recognizes it as food and it is more readily absorbed. It is important to note that the body can not absorb more than 500 mg of calcium at a time. If you are taking more than that it is going down your toilet, or if it is of poor quality it is causing the problems stated above. It is best to take calcium supplements twice a day, in the morning and at night. Is best absorbed in an acidic environment. Does not require extra stomach acid for absorption. Provides less elementary calcium per pill, so higher magnesium consumption is necessary, however the calcium is of good quality and easily absorbed. If you suffer from acid reflux it may increase acid reflux. Adding magnesium will decrease stomach irritation. Combination of Calcium and glucose, which contains a low content of elemental calcium so a large dose is required. Magnesium is needed for absorption. There are many factors to bone health. Learn more about a healthy diet for osteoporosis here. 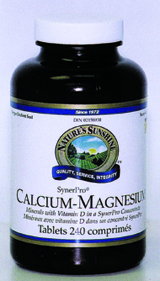 SynerPro Calcium & Magnesium by Nature's Sunshine is the best natural calcium supplement bar none. It recognizes that each of its components depends on the other for proper assimilation in the body. Calcium is essential to the health of bones and teeth, and plays a role in many cellular functions. Magnesium is closely associated with calcium in bone metabolism and is a key electrolyte. This combination also includes vitamin D, phosphorus, zinc, and copper. Recent research shows that calcium operates according to a diurnal time cycle. During the day when the body is active, calcium in nerve cells is utilized for muscle contraction and nerve transmissions. When this calcium is depleted, muscle fatigue is experienced. During sleep when the body is inactive, calcium is extracted from bone tissues to replenish cellular stores, that is, unless calcium is being adequately supplied in the diet. Researchers have shown that taking calcium supplements at night helps to balance calcium levels in the blood, reducing the risk of calcium deficiency and osteoporosis. Recommendation: Take two tablets with a meal twice daily. 240 tablets. SynerPro Calcium & Magnesium - $29.13 Cdn.